There’s a new hot spot in Boonsboro! 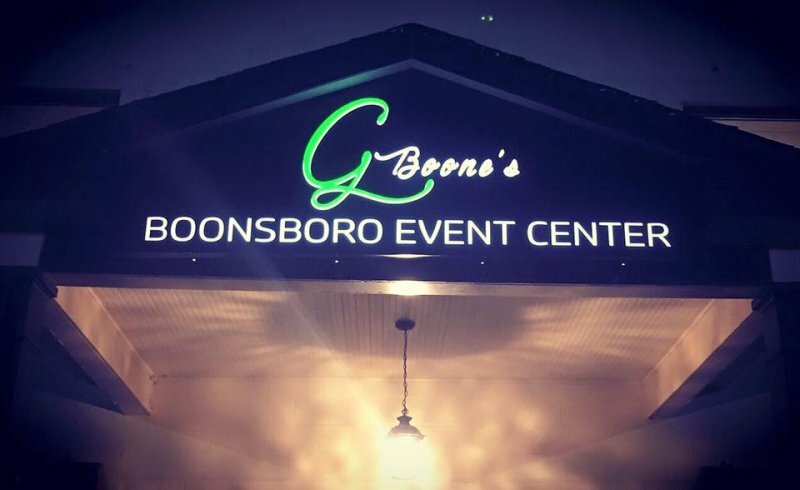 G Boone’s is opening soon, and we have fabricated a beautiful interior lit cabinet sign for their entryway. This cabinet is custom shaped to fit exactly under the eave. It has an aluminum face, with push through acrylic letters. We used G Boone’s own custom logo for this, and it looks great both night and day. Just another example of using a customer’s custom artwork and transforming it into exactly what they need to promote their business! 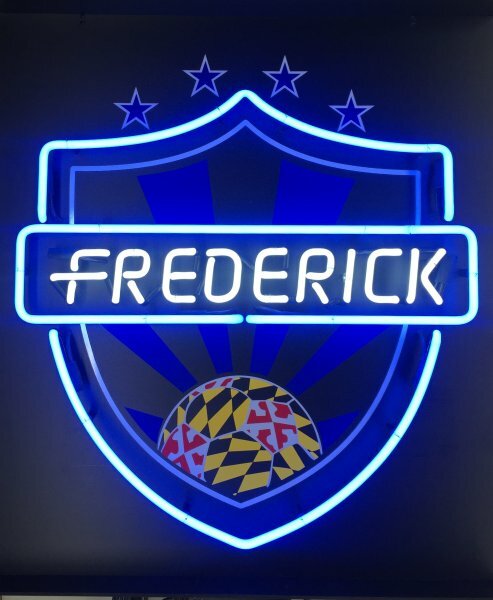 Our neon specialist just completed this gorgeous neon shield for FC Frederick. It’s around 3’x4′, and is due to be auctioned off for a fundraising event. The neon shield surrounds cut vinyl graphics, on a black pvc background. This is an excellent example of our custom neon ability to take almost any logo or design and translate it to neon. 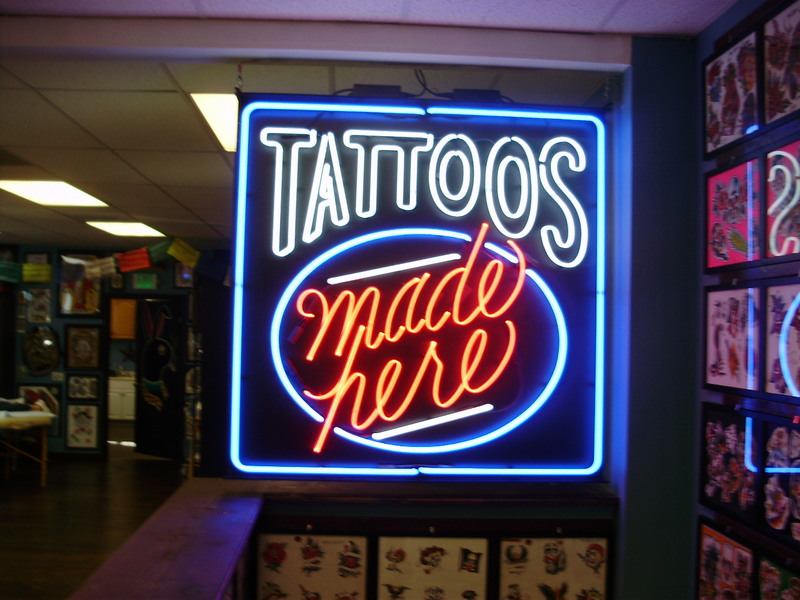 Do you have a neon sign idea for your business or organization? Give us a call today or stop by the shop and let our designers and neon specialist work with you to make your neon a reality! Watch as Michele & Dominic go through the process of wrapping the back doors of a tractor trailer for Alco Doors. We’ve sped up the process, which normally takes a couple of hours. If you have a tractor trailer fleet, don’t let those rear panels go to waste! Let Affordable Signs & Neon design a high impact wrap, and you can start utilizing that valuable advertising space in no time! Completed signs for If The Shoe Fits! Despite the big snow this past week, we were able to get the completed signs for If The Shoe Fits installed at the Hagerstown Prime Outlets! The new signs look great, and will really draw in the customers. Each sign is routed from exterior PVC for durability, and the background was masked and painted with the logo colors. Looking good! This is a short video showing our neon specialist Haley bending a small letter ‘o’. It’s a fascinating process!